Scientists have discovered how cancer cells grow faster in the human body. The scientists at UWE Bristol and the University of Bristol published their findings in the journal Cancer Cell. They reveal that cancer cells grow faster by producing their own blood vessels. Cancer cells gain the nutrients they need by producing proteins that allows blood vessels to grow. These blood vessels help deliver necessities such as oxygen and sugars to the tumor. The cell produces this proteins through splicing - the slotting together of different parts of genes. The team discovered that mutations in one specific cancer gene can control how splicing is balanced, allowing a master switch in the cell to be turned on. 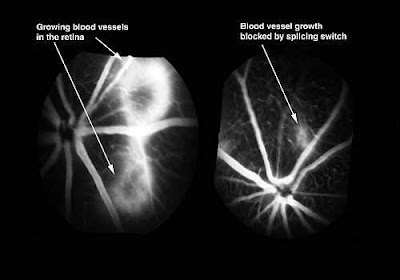 This master switch of splicing makes cancer cells grow faster, and blood vessels to grow more quickly, as they alter how VEGFs are put together. VEGFs are Vascular endothelial growth factors which is a signal protein produced by cells. It stimulates vasculogenesis (a process of blood vessel formation) and angiogenesis (growth of new blood vessels from pre-existing vessels) and is part of the system that restores the oxygen supply to tissues when blood circulation is inadequate. In experimental models, the researchers found that by using new drugs that block this master switch they prevented blood vessel growth and stopped the growth of cancers. UWE Bristol team leader, Dr Michael Ladomery says, "The research clearly demonstrates that it may be possible to block tumour growth by targeting and manipulating alternative splicing in patients, adding to the increasingly wide armoury of potential anti-cancer therapies." Professor David Bates who led the team from the University of Bristol's School of Physiology and Pharmacology, said: "This enables us to develop new classes of drugs that target blood vessel growth, in cancer and other diseases like blindness and kidney disease." The research was also assisted by Southmead Hospital where patients with kidney disease helped by allowing tissues that had been removed during surgery to be used in the research. The research started by studying kidney cancer. The team also includes Professor Steve Harper and Professor Moin Saleem are both Nephrologists. Saleem is a Consultant Pediatric Nephrologist, whose lab helped to make the cells used. A nephrologist is a physician who has been educated and trained in kidney diseases, kidney transplantation, and dialysis therapy. Harper says, "This shows how important it is for patients, doctors and scientists to come together in an excellent environment like Bristol to make these groundbreaking discoveries." Professor Moin Saleem adds, "We are really grateful to the patients who allowed their cells to be used in this research, as we hope it will eventually help the development of new drugs.